Last week, the industry got together for Consensus 2018, an event managed by Coindesk, and attended by over 10,000 participants. The mood was upbeat, people were fundamentally rallying around the technology and their tokens, but what was apparent was that the industry needs to begin to clean up the space. With all the hype and meteoric Bitcoin valuation of December 2017, in my view, this year's event was invaded by mainstream and institutional investors hunting and willing to throw money down on the next big thing. In Switzerland, the Swiss regulator announced its study into the possibility of the state launching its own digital ‘e-Franc’ and other countries are exploring this option too. But despite all this positivity and news, all the cryptocurrencies have all decreased across the board. Bitcoin has fallen by more than $670.63 in the last seven days settling at $7435.40 as of this morning. This decrease in value, especially after Consensus week is causing concern across the various markets. Just this week the Department of Justice has launched a probe into spoofing of trades, which could be linked to market manipulation of cryptocurrencies. Prior to Consensus, the general mood was that crypto’s would be back on bull run, but this week Wall Street Journal and China’s National Committee of Experts have published a report stating that as much of 20% of all ICO are scams. This is not helping the industry and as mainstream institutions begin to take cryptocurrencies more seriously, regulations and scrutiny is required to allow real tokens an opportunity to thrive. Ethereum has also had a decrease in its valuation, just seven days ago the token was valued at $681.71 to settle at todays value of $596.45, a loss of $85.26 per token. This is more than 10% of its value lost in one week and a sharper decline than Bitcoin. Similarly Ripple has also decreased from last week’s price of $0.67 to todays valuation of $0.62. 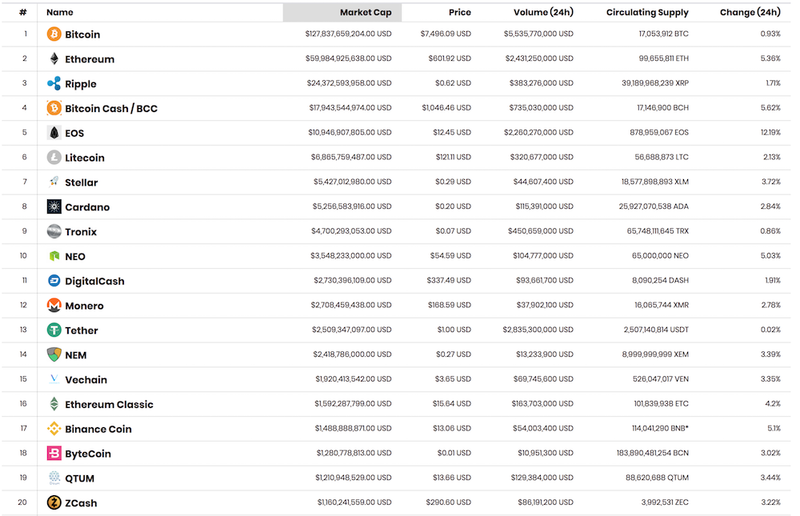 While Ripple represents similar decrease across the market as a whole, the token feels more stable than the rest. Ripple continues to sign up clients on its crypto trading app and this week the company announced a new deal with finch company, Revolut. Seven days ago, Bitcoin Cash was valued at $1,196 and has since decreased to $1,035 as of noon today. Bitcoin Cash has struggled to convince and rally the community to back its token.